¿Cómo? Acabo de verlo… ¡Un anuncio de compresas que absorbe incluso estando boca abajo! ¡No puedo creer que una gran compañía de productos de higiene íntima haya diseñado unas compresas con esa maravillosa cualidad! Y de pronto me pregunto, pero, ¿quién, en su sano juicio, se pone boca abajo en su periodo de menstruación? A parte de las preciosas jóvenes que hacen el anuncio, con sus preciosas melenas extendidas hacia el suelo y colgando de un trapecio por sus preciosas rodillas… Las yoguinis desde luego que no (bueno, yo sí, lo confieso) Este tipo de compresas se habrán diseñado para trapecistas, gimnastas, acróbatas, contorsionistas, bailarinas, bomberos, militares, astronautas…. No para yoguinis porque practicar posturas invertidas, durante la menstruación, ¡todas sabemos que es un error de los gordos! Y, otra cuestión es, ¿la sangre no caía hacia la tierra? Me desconcierta y me invita a reflexionar e investigar. Tengo 52 años y desde hace un par de años mi menstruación aparece y desaparece cuando quiere, a su amor. Creo que quiere decirme que, en unas de éstas, ya no volverá más y mi menopausia abrirá la puerta a otra fase de mi vida. Son muchos años recibiendo con amor su visita y aún recuerdo que en mi juventud escuché muchas veces cosas como que con la menstruación no debías ni lavarte el pelo, ni ducharte, ni hacer mayonesa y una larga lista de cosas, unas más absurdas que otras, la verdad… Confieso que las hice todas, al principio con miedo de que me pasara algo realmente grave a mí o a mi mayonesa y, con el tiempo y mi propio criterio, las hice con la confianza de que solo eran cuentos de miedo, limitantes, que mantenían a la mujer bajo “control”. What? I’ve just seen it… An advertisement about a sanitary pad that absorbs even when upside down! I can’t believe that a large company of intimate hygiene products has designed pads with that wonderful feature! And suddenly I ask myself, who in their right mind turns upside down during menstruation? Apart from the gorgeous young women appearing in the commercial, with their stunning long hair cascading to the ground, swinging in a trapeze with their nice legs…. Yogis certainly don’t –well, I must confess, I do-. This type of sanitary pad has probably been designed for trapeze artists, gymnasts, acrobats, contortionists, dancers, firewomen, soldiers, astronauts… but not for yogis. 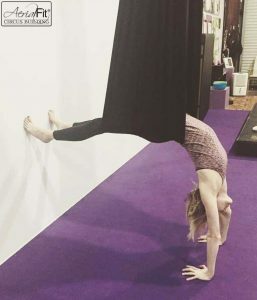 Practicing inverted postures during menstruation, as we all know, is a huge mistake. And, another question is, doesn’t the blood come out? It puzzles me and invites me to reflect and search. I am 52 years old and my menstruation has been appearing and disappearing for a couple of years as it pleases. I think it is trying to tell me that one of these days it won’t come back and my menopause will open the door to another stage in my life. I still remember that in my youth I often heard things like, “when you’re menstruating you shouldn’t wash your hair, or take a shower, or make mayonnaise, and a long list of other things even more ridiculous. The truth is I did them all. 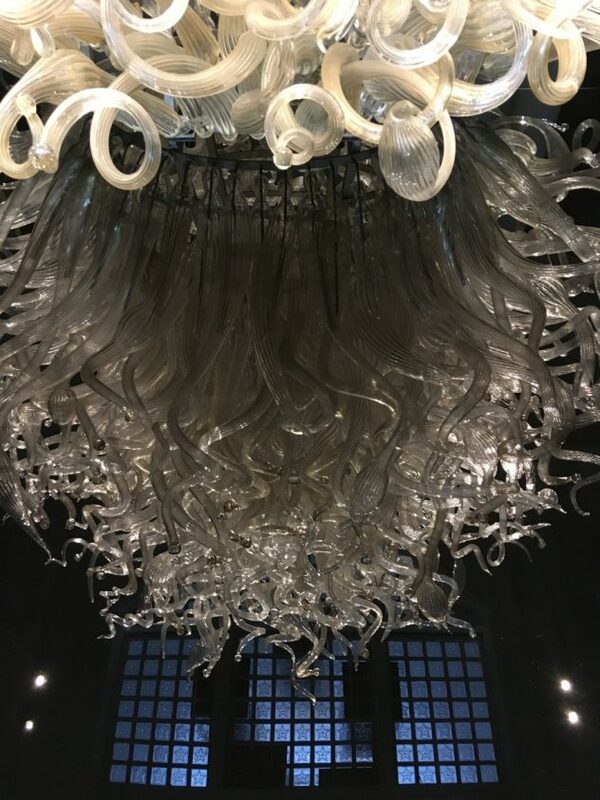 At first with fear that something really serious could happen to me or to the mayonnaise and over time and my own judgment, I did them thinking that they were only scary stories, limiting factors that kept women under control. I grew up in Colorado where my family and I spent a large part of our time in the Rocky Mountains hiking, camping, and contemplating the silence of nature. I’m sure it came as no surprise to my family, then, when I became a teacher of Hatha Yoga. Like hiking among majestic mountains, Hatha Yoga uses strength, endurance and flexibility to seek an inner calm and peace. My practice of Hatha Yoga is therefore a natural outgrowth from my own personal history. Many people ask me where aerial yoga comes from, or who invented it. 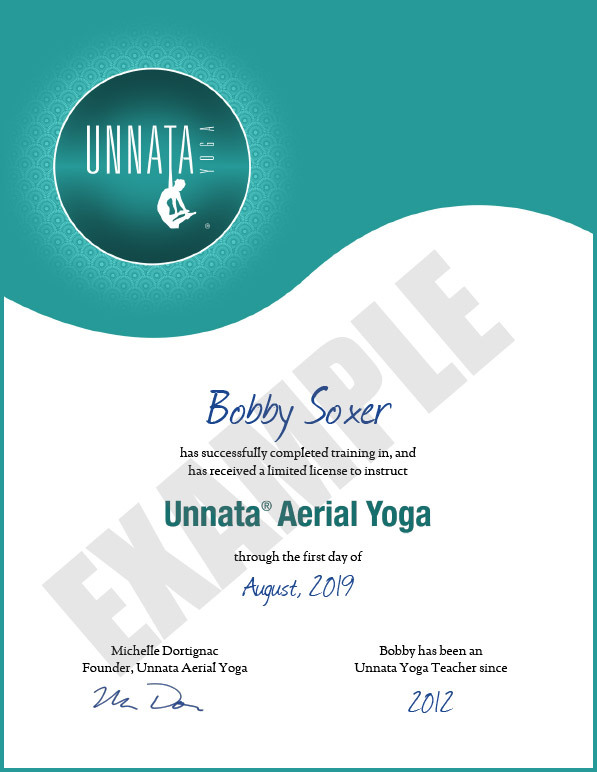 Just like my own study of Hatha Yoga was the natural evolution of my childhood upbringing, Aerial Yoga evolved naturally over time through contributions from many yoga and movement teachers, each using their ingenuity to contribute a puzzle piece to the whole picture of what aerial yoga is today. As far as I am aware, BKS Iyengar (1918-2014) was the first yoga teacher to hang students off the ground upside-down. He was looking for a way to help his students achieve the king of poses, headstand. Over time, he and his teachers created a whole system of using ropes attached to a smooth wall to suspend a student in a variety of asanas, including a supported headstand. He developed exercises using the rope wall to relieve stress on the joints, and improve postural alignment within asana practice. There have been numerous studies in the last ten or so years that have researched the effects of individuals who practice yoga. Some studies were focused on mental influences, some on health benefits, some were more interested in physical benefits and some even wanted to prove cognitive improvements which resulted when practicing yoga. It is beyond a doubt that a regular yoga practice can improve overall physical well-being, including an increase in flexibility, strength, balance and mobility. It is also a powerful tool to tame anxiety and depression by reducing stress and reconnecting our minds and our hearts with our bodies. 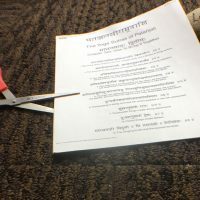 Interest in this field is constantly growing and researchers are looking into possible benefits for many issues that affect millions of people worldwide. The Yoga Sutras of Patañjali is a guide to the practice of Yoga. Compiled prior to 400 CE, it is still studied in depth today. In the text, Patañjali lists the Yamas and the Niyamas as the first two steps on the path of cultivating Yoga. Asana, or the postures we usually associate with Yoga classes, is the third step. If we were to place a seed on a plate, water it and place it in the sun for warmth and energy, even with careful tending, the seed still will not develop far. Without soil to take root in, and draw nutrients from, how is a plant to grow? The Yamas and Niyamas are the soil for the seed of our Yoga practice. If we do not “plant” our daily Asana practice in the rich and fertile soil of the Yamas and the Niyamas, then true health will not grow out of our efforts. Yoga has always been a very grounding experience for me. 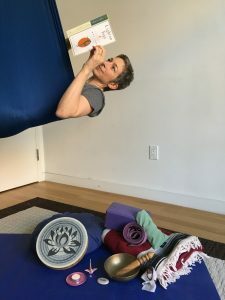 Something about feeling the ground underneath my feet, feeling every bit of connection to the floor, and experiencing the play of inhale and exhale… I have always left a yoga practice feeling very centered. I wasn’t sure what to make of aerial yoga when I first heard about it. I figured it would just be a fun novelty practice, worth trying because it looked like fun. I was surprised to find that using the hammock for yoga actually enhanced my connection to the earth and to my breath in new and interesting ways that carried forward. As someone who spends a great deal of time working against gravity in my everyday life as an aerial instructor and performer, the way we use the hammock in aerial yoga provides a nice balance. When the hammock is used to its full advantage, the upward pull of the aerial yoga hammock enhances our appreciation for the downward pull of gravity. I constantly have students tell me how surprised they are that they can feel so grounded after an aerial yoga class. There are a few things I incorporate into every aerial yoga practice that allow for this groundedness to occur. 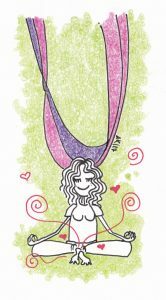 For anyone who’s ever practiced aerial yoga and felt a little too floaty, or even dizzy, I recommend trying these tips for grounding the next time you practice. Use your breath! Concentrate on feeling the upward pull of the hammock as you inhale, and the downward pull of gravity every time you exhale. Find places to relax and let gravity provide a nice downward pull to your body while you are hanging in the hammock. In many postures, the more you are able to relax in the right places, the more grounded and extended you will feel. March 10, 2017 / Diane Tomasi / All Posts / Enter your password to view comments. 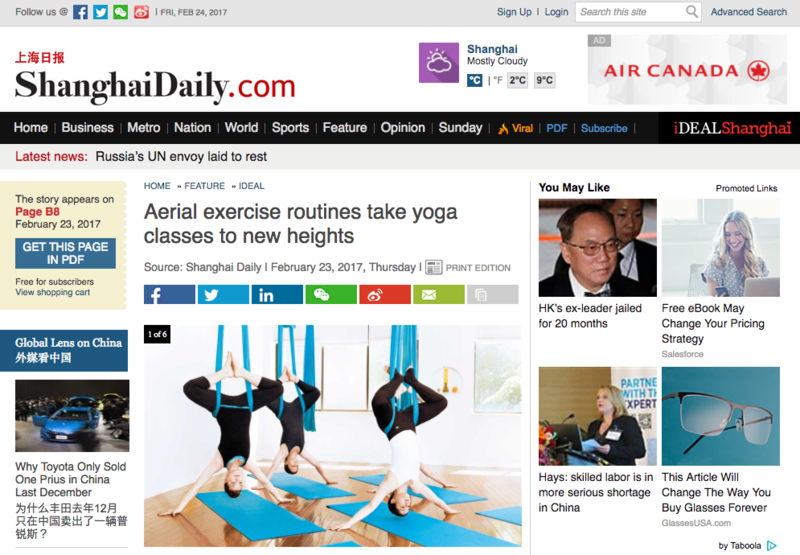 Unnata® Aerial Yoga is thrilled that Michelle Dortignac has been interviewed in ShanghaiDaily.com. 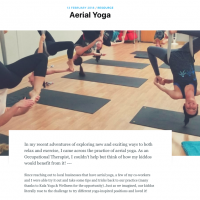 In the interview Michelle explains her reasoning behind starting Unnata® Aerial Yoga, how it has grown throughout the years and its numerous health benefits. In the article Michelle also explains how Unnata® is specifically different from other kinds of popular aerial yoga classes, keeping the authentic traditions of yoga at the forefront of the method. “When I first started working with an aerial apparatus, I could feel how it was helping support my yoga training,” recalled Dortignac.